It's funny how there are so many different Floridas. I love St. Johns County, where St. Augustine and Guana River and Fort Matanzas are located. Those are all along the coast, with lovely beaches, and palm trees. Also many tourists, and tourist destinations. It looks more like the tourist literature Florida. But you only have to get a few miles inland to see a totally different Florida. This painting is from that very different Florida. If you come home to my house from Fort Matanzas you can cut inland at route 206, then take 305 up to 13A, before connecting back to route 13 and then over the Shands Bridge. Along that route you find yourself in the middle of nowhere! Well nowhere that most tourists would venture. It's very rural countryside, mostly farms. Pine trees, not palm trees. 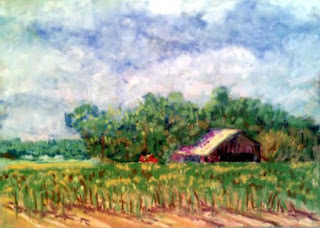 You drive along and see miles of pine trees, cattle, corn fields, barns and tractors and farm houses. Oddly, it reminds me a lot of the countryside near my summer home in New Brunswick, Canada. This coming Saturday we have our final meeting before the summer break of the First Coast Pastel Society and we are all supposed to bring in a wrapped 5x7 painting and have a painting exchange! It sounds like fun, but of course I had no paintings available as I never work in a small 5x7 size, so I had to paint a picture for the exchange. I ended up doing one of this barn I saw along route 305. The sun was glinting on the roof, and I liked the feel of it. I liked the idea of doing a painting of this "other" Florida also. We are being bombarded with rain today from Tropical Storm Beryl, so it's not a day for traditional outdoor Memorial Day activities. So I sat in my kitchen and looked out at the rain on my pond, and painted this from a reference photo I'd taken. It's done on UArt paper, the first time I've ever tried it. It worked well and held quite a bit of tooth.